View from live performance as part of the exhibition Out of Control at The Border, New York, 2018. Medium: Performance with Video projection, duration 18 min. 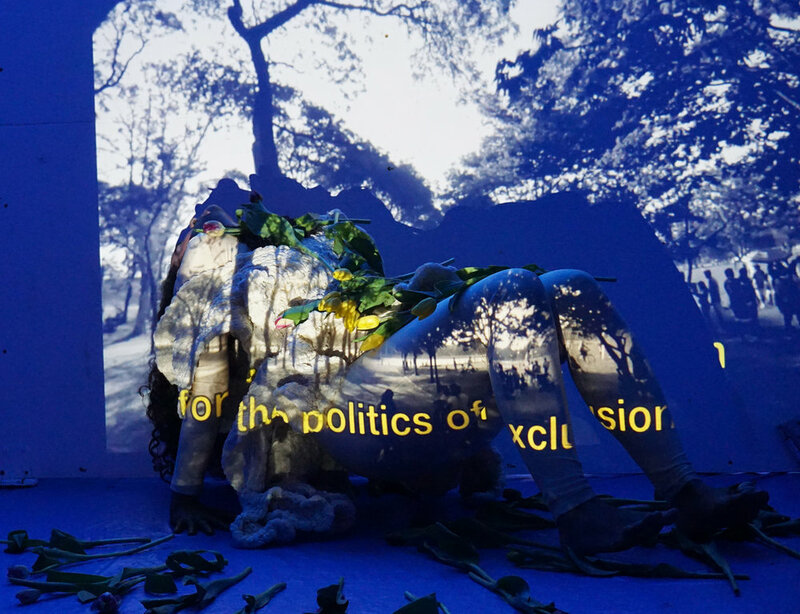 Materials: bodies, movement, conceptual garment, interviews, flowers, blue tarp, sound. Alien crosses genres and mediums, blending performance and movement, video and costume. It explores the current situation in Latinx immigrant communities in the US and Romagoza's experience as a recent immigrant coming from Cuba. The project is inspired by the Queens NY neighborhood where the artist lives since 2011. Alien seeks to give visibility to a community that society ignores and delegitimizes as it also reveals utopian visions of the American dream. Choreographer/performer Priscilla Marrero improvises movement, responding to Romagoza's conceptual garment and video content. The video includes interviews with –Aliens-, immigrants from Queens, particularly non-U.S. naturalized citizens; also scenes of everyday life.